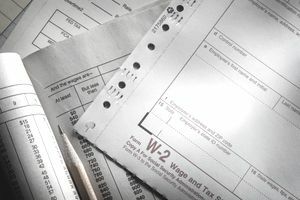 It's much easier to make corrections to W-2 forms before you file them with the Social Security Administration (SSA), but this has become a bit trickier than in years past. The deadline for filing W-2 and W-3 forms with the SSA was changed beginning in 2018. It's now the same as the deadline for providing W-2 forms to employees: January 31. You might want to give W-2 forms to your employees earlier in January now if you want to allow them some time to review the forms and alert you to any necessary changes before you file them with the SSA. IRS Form W-2 is used by employers to report annual income and withholding to employees and to the Social Security Administration. Form W-3 is a transmittal form that shows totals for all employees for all items on the W-2 form. You must prepare and distribute a W-2 to each employee, showing wages and withholding for the year, by the end of January of the next year. Then you must prepare a W-3 transmittal form and send it along with all your W-2 forms to the SSA. The W-3 form summarizes and details each of the W-2 forms you're submitting. It's not required if you file online. The exact deadline can change slightly each year allowing for weekends but count on it being on or very close to the last day in January. You can submit W-2 forms electronically using the Social Security Administration's Business Services Online (BSO) system. If you file the forms this way, you don't need to submit a W-3 form. You can also submit W-2c and W-3c forms through the BSO system. If you file 250 or more W-2 forms during a calendar year, you must file them online through the BSO system. Forms W-2c and W-3c are correction forms and must be submitted to the SSA if you need to make most changes to your W-2 forms. But an exception exists if you have not yet submitted the incorrect W-2 to the SSA. In this case, you would not issue a Form W-2c to correct the mistake. Simply check "void" on Copy A of the original form, the copy that's sent to the SSA. Then create a new W-2 with the correct information. Write "corrected" on the employee's copy of the new W-2 and give it to the person, and send the correct Copy A to the SSA. Complete Form W-2c only up through box "i" if you reported the employee's name or Social Security number correctly on a previous form but the name or SSN is incorrect this year. You don't have to complete the numbered boxes with wage and withholding information. Simply redo the original W-2 and give it to the employee if this is the first time you've incorrectly reported his name or SSN. You'll also have to complete and submit Forms W-2c and W-3c if you've already sent the form to the SSA along with the W-3. You cannot use the W-2c to add the information if the error is a missing employee name or SSN. You must contact the SSA directly with this problem at 1-800-772-6270. Make sure that the Employer ID Number (EIN) issued to you by the IRS is used on all of the W-2's you file. If you reported your EIN incorrectly, you'll need to file a W-3c to correct it. All boxes on the W-2 form must show "0." Don't leave the box blank. Fill out the W-2c completely, showing the original and corrected amounts, if you made an error in an amount either for withholding or earnings. You might also have to file Form 941c if you incorrectly reported wages or withholding on a 941 - Employer's Quarterly Tax Statement. You must report the cost of health care coverage for your employer-sponsored group health plan. This information appears in box 12 of the W-2 and it's coded "DD." It doesn't affect the employee's tax situation, but you must nonetheless submit form W-2c to correct any mistakes here, according to the IRS. Retirement plan information appears in box 13 of a W-2, and making a mistake here can cause all sorts of headaches for your employee. It can leave him open to audits, and you don't want this. Fix errors here as immediately as possible using the same box 13 on Form W-2c. If you paid wages to an employee in error, these wages are still taxable to the employee. Don't use a W-2c to report corrections to an employee's back pay. You must purchase copies of Form W-2c. Don't try to use the one on the IRS website because that's not official. You can buy the correct form on the IRS website, however, or at any reputable office supply store or website. Filing online will save you the trouble of getting thee forms. Be sure to get your W-2s out to your employees by the due date and your W-3s transmitted to the SSA on time, including corrected versions, to avoid penalties for late distribution and filing. Penalties range for $50 for each W-2 corrected within 30 days of the due date, up to $260 for each form if you wait until after August 1. This increases to $530 or 10 percent of any unreported amount if you don't address the situation at all. This article is a general overview of these wage and tax statements. It is not intended to be comprehensive. Read the instructions found in the documents carefully before you complete a W-2c or W-3c. Did You Forget W-2 Forms and 1099-MISC Forms? How do I prepare and file Form W-3?